Fire crews knock down a 40 acre grass fire near New Underwood Thursday. NEW UNDERWOOD, S.D. 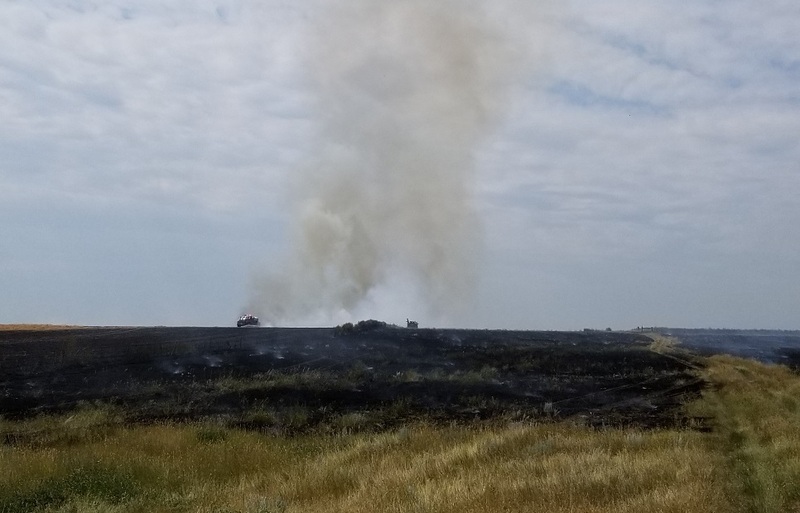 - The New Underwood Volunteer Fire Department responded to a report of a wildland on fire on 171st AVE, one mile north of exit 88, Interstate 90, unincorporated Pennington County, South Dakota. Upon arrival Firefighters observed a fire burning in cured grass and wheat stubble. A Temperature of 92 degrees Fahrenheit was recorded at the Incident. There were no threats to the public, structures or infrastructure. The fire was contained to approximately 40 acres, with the cause under investigation. No injuries to Firefighters, Civilians or domestic animals were reported. Pennington County 911, New Underwood Volunteer Fire Department, local ranchers and neighbors, Box Elder Volunteer Fire Department, United States Air force 28th Bomb Wing/Ellsworth Air Force Base Fire Department, Elm Springs Volunteer Fire Department, North Haines Volunteer Fire Department, Rapid Valley Volunteer Fire Department, Pennington County 911, and the Pennington County Fire Service.